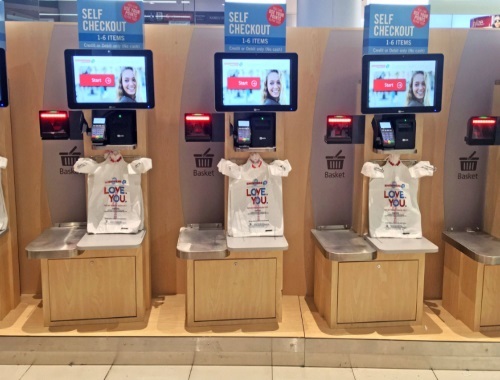 Do you use the self-checkout lanes at Shoppers Drug Mart? A lot of stores across the GTA now have them and people were apparently annoyed with the "snarky teen" voice that it had. So much so that Shoppers is changing/has changed the voice. You can listen to the before and after newly improved voice at the link below. Nothing appears to have changed with these self checkouts expect for the voice prompts. To be honest, I didn't notice anything bothersome about the voice. I am a big fan of the self-checkout lanes. I know there is always the criticism that self-checkout lanes eliminate jobs but when was the last time that you saw ALL the checkout tills open? Living in a big city there are lineups everywhere and self-checkouts are a huge time saver. Even tonight I stood in line because I wanted a ballot for the all-inclusive vacation contest that Shoppers is running, but ended up opting for the self-checkouts because it was taking too long. Click here read the BlogTO article. Never found anything particularly wrong or annoying about the self check out voice other than it's a bit loud. These stores are just trying to get rid of employees. I do not care what voice I hear, i want it to be a employee voice. Society is trying to program us as sheep and follow without question. Please my fellow humans do not be a sheep . Do not let society program you to follow without question. We need to interact with other humans in order to grow. We rely on our phones and computers for a minimum of human contact. I want to see someones ,face and expressions ,not a unknown voice ,from a machine. I don't live a SDM so I didn't even know they had self checkouts until yesterday. I am more likely to buy something or more things if I can use the self checkout! Anyway, fun tid-bit about the voice change!